If you’re a Seattle fan needing pro hoops therapy, Damian Lillard is doing remarkable things in Portland, where the Blazers seek to tie their playoff series with the Warriors Monday night. PORTLAND – Skip Bayless, the cantankerous co-star of ESPN2’s “First Take” sports talk show — at least until he leaves next month — has made a living out of making outrageous comments with little or no basis in fact. It was the misfortune of Portland Trail Blazers point guard Damian Lillard to become the bullseye for Bayless’s verbal dart board last week. “I’m constantly a little disappointed by Damian Lillard . . . I just don’t see enough consistency from Damian Lillard to say he’s a star in (the NBA),” Bayless said. If that seems a tad harsh, it may be due to the fact that Lillard averaged 25.1 points and 6.8 assists this season. That compares quite favorably to the 25.3 points and 6.8 assists of Cleveland Cavaliers superstar LeBron James, generally considered to be one of the greatest players in history. Also worthy of note is Lillard’s steady stream of 20-point games; his proven record of clutch performances late in close games; and his 25.2 scoring average in playoff games this season. Lillard refused to confirm or deny the post was aimed at Bayless. 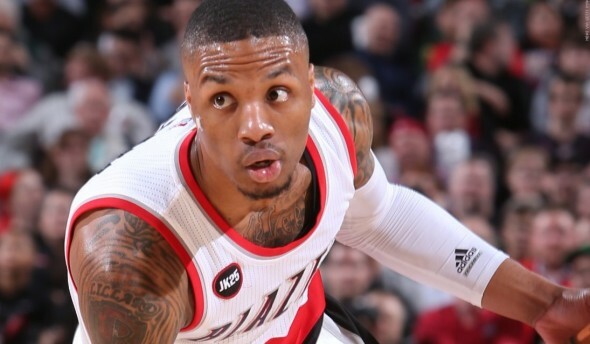 Actions speak louder than words, of course, and in his first game after Bayless’s criticism, Lillard recorded career playoff highs of 40 points, 10 assists and eight 3-pointers in Portland’s 120-108 win over visiting Golden State. In the first round of the playoffs, he helped lead the Blazers out of an 0-2 hole to take four in a row from the Los Angeles Clippers, owned by Steve Ballmer, Allen’s one-time co-worker at a computer shop in Redmond. On and off the court, he might add. Lillard has been heavily involved in community activities since the Trail Blazers, owned by Seattle’s Paul Allen, made him the sixth overall pick in the 2012 draft. “I was always taught you’re not above the group,” Lillard said. “You have to look out for the next person. That’s the greatest thing you can do. Lillard grew up poor in a rough section of Oakland, where he shot basketballs at a milk crate attached to a telephone pole. He was robbed at gunpoint as a teenager. Now Lillard makes millions playing a game while living with his mother, sister and girlfriend in the large suburban home he purchased. Teammate Gerald Henderson says the affable Lillard is “by far” the most popular person in Portland. Lillard has emerged as the unquestioned leader of a young team that shocked the “experts” by finishing second in the Northwest Division behind Oklahoma City despite losing four starters in the off-season. The Blazers, who tangle with Golden State Monday night in Portland (TNT, 7:30 p.m.), likely would be trailing 3-0 in the best-of-7 Western Conference semifinals if not for Lillard’s memorable performance Saturday. Lillard, 25 going on 50 in terms of maturity, makes it sound easy.